Adapted from the articles “Spacing Walnuts for Optimum Light Interception and Production” by Bruce Lampinen, Walnut and Almond Specialist, UC Davis and Janine Hasey, UCCE Farm Advisor, Sutter, Yuba, Colusa Counties; and “Perspective on trends in orchard spacing, pruning and potential disease” by Joseph Connell, UCCE Farm Advisor Emeritus, Butte County in the Sacramento Valley Walnut News, March 2013 and April 2014, respectively. 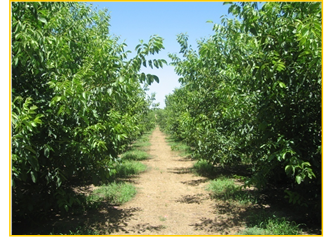 There are many considerations before planting a walnut orchard. One of the most important is determining the orchard design system and tree (between trees within-row) and row spacing. A planting design should provide the tree canopy with maximum exposure to sunlight and allow ease of equipment operation. Below is information to help decide between a standard spaced or hedgerow configuration, and to set spacing for optimum production. Using an ATV Mule equipped with a light bar for measuring midday photosynthetically active radiation (PAR). This measures ‘canopy light interception,’ essentially what percent of sunlight is being intercepted by tree leaves, and what percent is hitting the orchard floor. At harvest, nuts from the same area are picked up and weighed to correlate percent midday PAR (light) interception with yield. 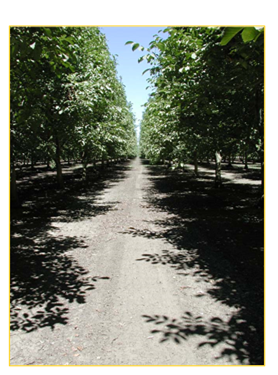 The pre-dominate variety in this multi-year study has been Chandler but some Tulare, Howard, Forde, and Gillet were also measured, mostly on Paradox rootstock. For each 1% of total midday PAR light intercepted by the canopy, healthy trees can produce up to 0.05 in-shell tons/acre (or 100 in-shell pounds). The fastest growing orchards can increase by 10 percent per year in light interception, reaching about 90 percent cover by the ninth year. Yield appears to peak at about 10-12 years of age and then gradually decrease. Walnut limbs need 30-45 minutes of direct sunlight to keep lower wood productive. Approximately 45% midday light interception. Photo: Bruce Lampinen. Light interception increases with increasing tree density. Yield tends to peak at 65-80 trees/acre. Standard spaced orchards have about 80-85 % light interception which results in a mature orchard yield potential (maximum possible yield) close to 4 tons/acre. 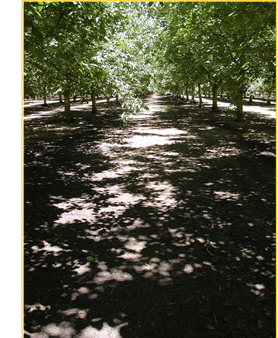 Most walnut hedgerows have 65-75% light interception, resulting in a yield potential of 3.2 to 3.7 tons/acre. However, since vegetative growth is stimulated in response to hedging, yield is slightly less than light interception would suggest, about 2.7-3.2 tons/acre. Optimum tree spacing appears to be in a standard square or offset square spacing design at about 56-75 trees per acre (e.g. 25’ x 25’ = 70 trees/acre, 28’ x 28’ = 56 trees/acre). Remember, when determining optimum walnut tree spacing, always consider soil type, rootstock, variety vigor and growth habit, and management style/design system (e.g. closer spacing is recommended if planting on more marginal soil or if using black rootstock). Approximately 70% midday light interception. Photo: Bruce Lampinen. Chandler, a vigorous variety, predominates in the walnut industry. In this canopy light interception and yield study and a previous study in the 1990s comparing hedging intervals in a Chandler hedgerow, results indicated that it takes 3-4 years to redevelop the complexity of branching that existed before hedging. Therefore, production will be lost for the first few years after hedging. We recommend planting Chandler in a standard spaced orchard for long-term maximum yields (25 ft. x 25 ft. minimum on poorer soils, wider on better soils). If a hedgerow design is still desired, then consider Howard, which is a less vigorous, smaller tree than is Chandler. Approximately 90% midday light interception. Photo: Bruce Lampinen. Planting walnuts at the correct density so trees fill their space without crowding should reduce shading and may help avoid the need for mechanical hedging, both of which should help minimize dead wood and reduce disease pressure. Later selective pruning to remove dead, diseased, and broken limbs is likely to pay dividends in helping to manage pressure from diseases such as Botryosphaeria.